Concerned that Syria has missed the 13 April deadline to remove most of its chemical agents, the Joint Mission of the Organisation for the Prohibition of Chemical Weapons and the United Nations (OPCW-UN) says that it expects “an intensification of efforts” towards meeting the goal of removing all the country’s chemical weapons by the end of the month. In New York, UN Spokesperson Stéphane Dujarric confirmed the Joint Mission’s concerns about the missed deadline and told reporters that it expects immediate action to initiate the high pace and scale of operations for the removal of all chemical weapons materials as safely as possible by 27 April. 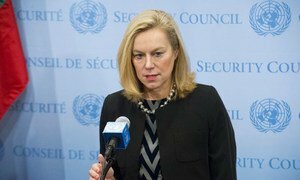 “Missing the 27 April timeline could have serious impact on the completion of the elimination of Syria’s chemical weapons programme by 30 June,” said the spokesperson. The removal of the most critical material for destruction began in early January, in line with an agreement brokered by Russia and the United States under which Syria renounced its chemical weapons material and joined the 1992 Convention on the Prohibition of the Development, Production, Stockpiling and Use of Chemical Weapons.